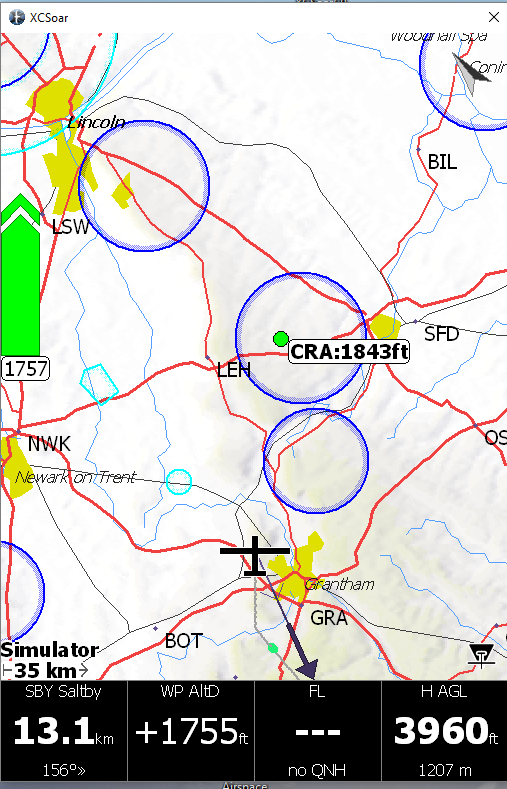 Perkoz – Flarm, S7 Vario and Oudie Navigation – DON’T PANIC! The good news is we have a wonderful new glider, the ‘bad’ news is we have a lot of new instruments in it. This is a quick guide as to what they can do (if you want them to). This is not designed to be a comprehensive guide, just a place to start. Fuller training will be available or take a flight with someone who can demonstrate this to you. As a last resort, download and read the manuals! Act as an IGC logger, logging all flights. A warning consists of an audio signal, ranging from a single ‘be aware’ beep, through a rapid series of ‘ take action’ beeps and finally to a continuous ‘imminent collision risk’ signal. At the same time a compass rose image (see below) appears, with the compass rose showing the position of the glider relative to your track and the right hand graphics showing above, same level or below. The central number is the horizontal distance to the closest target. Only a quick glance at the screen is required to show where the threat is, followed by a longer look for the glider itself. The image below is from the S7 manual. Note that the Flarm unit does not beep to show that it has detected a glider, only that is has detected a possible collision risk. Most beeps will be for traffic you have already seen and are managing separation. Experience of many pilots says that even the most observant pilots will not see all traffic and that Flarm is a great safety aid, but not a replacement for keeping a good look out. 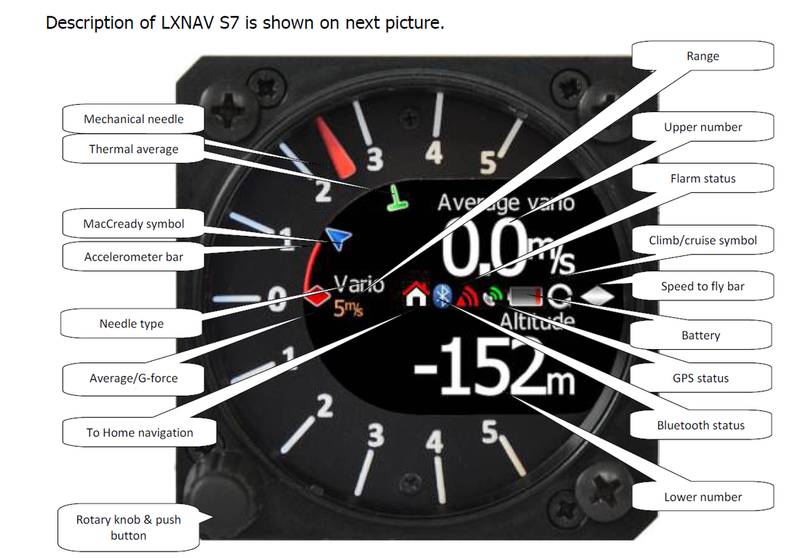 S7 Vario: The S7 is a modern vario and navigation device that integrates with the Flarm and Oudie / XC Soar software. To use the S7 as a vario, showing rate of climb (or sink) simply leave the “cruise climb” switch (a separate switch near the top of the front panel) in the up position (think ‘climb = up’). In this “Climb” setting the main needle will display the rate of climb or sink of the glider at any time, with the audio replicating this information. The upper number will show the average climb rate over the last 40 seconds and the lower number will show your arrival altitude back at your take off point, with an 800 foot safety margin. Leave the vario in this setting if you simply want the vario to work like the one in the K21 or Puchaz! In “cruise” mode (the switch down) the needle will display ‘Netto’ information, which is what the air mass is doing, rather than what the glider is doing. This is very useful for routing your flight in rising air rather than sinking air. Audio information in cruise mode indicates whether to speed up or slow down, information which is also shown graphically by a bar on the right centre of the screen (see below). On a completely still day, flying in Netto mode should result on the needle being on the zero marker at all speeds! NOTE – The Netto function and that of the arrival altitude depend on the vario having an accurate polar curve of the glider. We have created a polar for the 20m Perkoz with two people on board, based on the supplied data, but at the time of writing the accuracy of this has not been tested. We can adjust the polar settings to make sure the information given is as accurate as possible, but initially use with caution! You can change the Macready and bugs setting on the S7 via a single press of the rotary push knob. Please do not change the configuration settings on the S7! Current way point, in this case SBY (Saltby). It is 13.1km away on a relative bearing of 156 degrees. WP AltD is your estimated arrival height at that waypoint, not including an 800 foot safety height. So in this example, you are 1755 feet above the height required to arrive back at Saltby at 800 feet (enough for a circuit), so in theory you would arrive back at Saltby at 2555 feet QFE. FL is your flight level, which does not work in simulator mode as no QNH has been set, this will work in the Perkoz so long as you correctly set the take-off altitude on the S7 vario. H AGL is the height above the ground, useful as an estimate for when you are flying away from Saltby, over significantly lower or higher ground. In order for you to practice using XC Soar on the ground, a simulator is available for you to download at http://saltbyxc.co.uk/XCSoar and a fuller briefing is also available there. To use the Oudie in the glider, simply clip it into the mount, plug in the cable (which supplies data and power), switch on the unit (lower left hand side) and wait for the XC Soar screen, then press ‘fly’. You should see a screen like the one above. A two seat glider is the ideal place for one of the two pilots to practice using the device whilst the other focuses on flying! Note that occasionally the info boxes at the bottom of the screen become blurred by the map, in which case simply swipe left and then swipe right again to refresh the screen. The Oudie is an excellent device for helping navigate and more importantly avoid airspace and using it regularly on local flights will help prepare you for trips further away from home.